Did you know that there are two Lakes Vrana in Croatia? The one located between Zadar and Šibenik is a large ornithological area on the Mediterranean and has the status of a protected nature park. The other Lake Vrana is located on the Cres island and is one of the rare sources of drinking water on an island on the Adriatic. These same named Lakes often confuse the curious, but whichever Lake Vrana you choose, the freshwater wealth won't disappoint you. The Lake Vrana nature park has 251 types of protected, endangered and rare birds will lure you to an interesting activity – birdwatching. If you haven't tried that yet, try it, because the binoculars can be rented at the Park. You can search by kayak for nests in the high reeds or simply enjoy the peaceful water surface. The wetland ecosystem of Vrana Lake is an ideal place for cyclists from the nearby Rivieras Sibenik, Biograd and Zadar who can other than in the fascinating biodiversity, enjoy in the 40km long trail around the lake and the view from the hill Kamenjak of the lake, a part of the Kornati islands and the Murter island and places of the Biograd Riviera. Vrana Lake on the Cres island is also a natural phenomenon in a purely karst area. 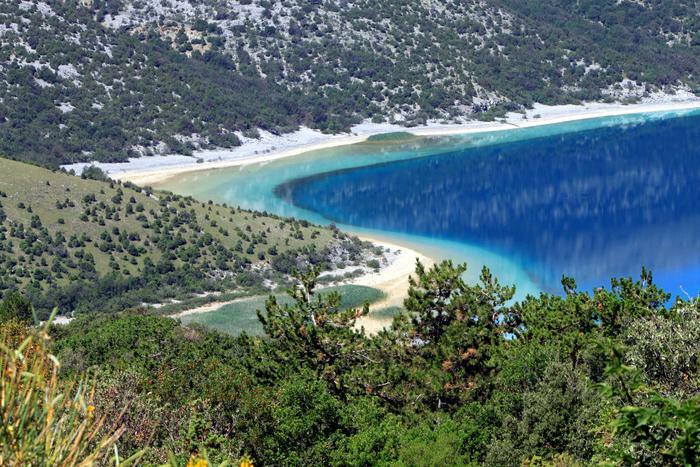 A large lake reservoir near the sea supplies the Cres-Losinj area with clean drinking water and surrounded by pine forests. Griffon vultures cover the sky and there is a fantastic story and the origin of the lake and the inhabitants of the surrounding lakes and caves – fairies. The origin of the water in Lake Vrana is studied in the present and the legend says that a sunken castle lies at the bottom. Along with nearby Lubenice, a town at a 378 meter high cliff above the sea, an eco-center in Belom, Osor musical evenings, Vrana Lake is one of the specialties of the Cres island, which you shouldn't miss.